1. The crocodile is said to be the largest living of its kind in the world and is named “Lolong” in honor of the person who captured it. In contrast to hearsay that it was mispelled instead of the name "So Long". 2. According to reports, the crocodile will be transferred into an eco-tourism park but animal rights activists like PETA (People for the Ethical Treatment of Animals) are urging the government to release the crocodile into the wilderness. An advocacy to protect animal lives more than the lives of human beings. 3. A saltwater crocodile that could be the world's largest in captivity has not eaten for six days since being captured in a creek in the southern Philippines. Stress caused the reptile to lose the appetite which is generally the same feeling when hospitalized, PGMA and FG could absolutely attest. 4. The crocodile was caught after a three-week hunt, easing some fears among the locals having known that the biggest crocodile can be found in Pampanga. 5. Local officials of Agusan del Sur are planning to build an ecopark around giant crocodile "Lolong." To boost for a bigger tourism in the province, they will soon build a human eco-tourism for the couple GMA and FG upon their captivity. 6. 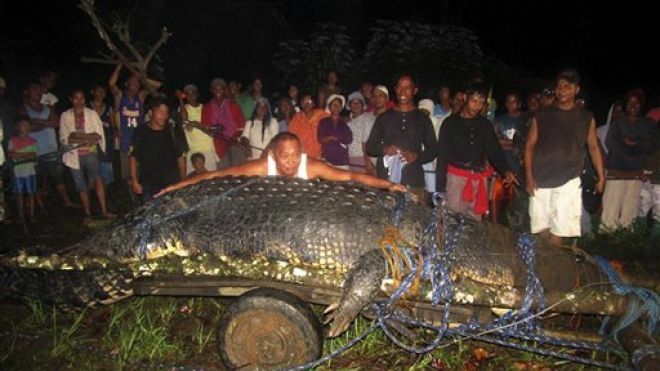 Those who live in areas near the Agusan marsh said that giant crocodiles such as Lolong have affected their way of life since PGMA reigned the office.